Much like my DUIs, none of my kids were planned, but unlike the DUIs, at least they were covered by insurance. I had a brief scare last week when I thought I was going to have another kid. In between letting my Glock rest reassuringly against my temple so I could feel the cold metal against my skin, I decided to review my insurance to see how much I was going to have to pay out-of-pocket. Surprise, I was going to have to pay all of it. 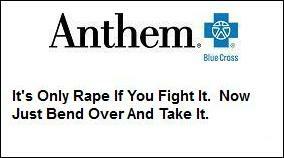 It seems that since my wife transferred from another Anthem Blue Cross plan to my Anthem Blue Cross plan in January, the insurance company decided she had to wait six months to get pregnant, or they wouldn’t cover anything. I called the company so someone could explain this to me, and the woman said pregnancy is considered a pre-existing condition, and even if you switch plans within the same goddamned company, you still have to wait six months for anything to be covered. I then told her not to say anything else because the way I was getting screwed, I might get pregnant, too. Anthem’s parent company made about $8 billion over the last three years, and they just dropped $900 million to buy 1-800 Contacts. Do they really need to screw pregnant women and unborn babies with procedural tricks? I guess part of me understands the logic here. Their CEO has only been paid $50 million in compensation over the last five years, and unless people like me get cheated, she’ll never be able to afford her new yacht.